Since 2009 City Farm and ecoRI News have partnered to collect community members’ food scraps and divert it from Rhode Island’s landfill. Community members could drop off their food scraps at neighborhood farmers markets, and City Farm would pick up the material and turn it into nutrient-rich compost for its many beds of vegetables, fruits, herbs and flowers. Beginning this season, they are changing the model of the program from collecting food scraps at farmers markets to a door-to-door pickup. The new program is called ecoRI Earth. Participating households receive a five-gallon bucket to store their food scraps, and ecoRI will stop by either weekly or biweekly to pickup the buckets, drop off clean buckets and deliver the scraps to City Farm or New Urban Farmers. Through this new model, ecoRI hopes to reach more people and encourage them to collect their food scraps in order to help urban farms in Providence produce high-quality local food and save space in Rhode Island’s central landfill. Click here to read more about the program! 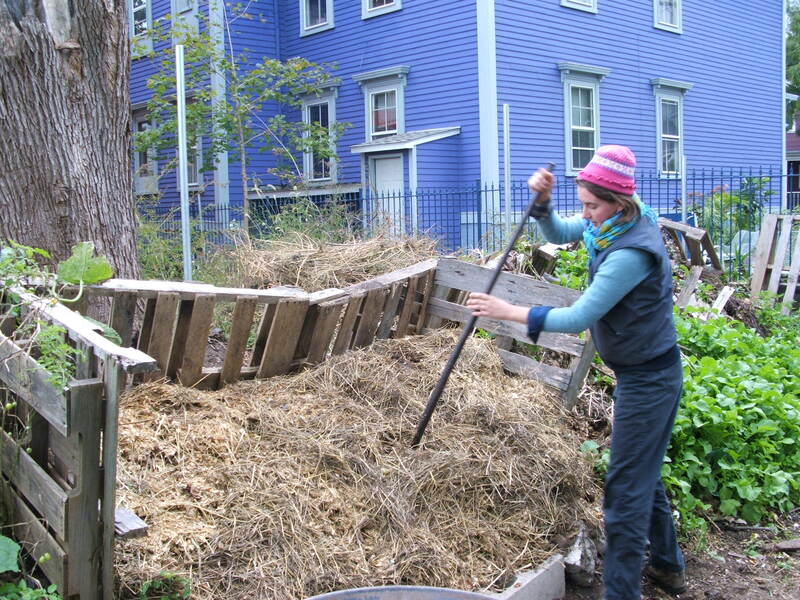 A major step of the City Farm composting process is to aerate the pile. This not only introduces more oxygen but also helps keep any unwanted critters away. Start saving water; reserve a rain barrel today! It’s been an extremely rainy June, and word on the street is that we’ve gotten a record amount of rainfall these past few weeks! The rain could not come at a more perfect time. SCLT is partnering with Groundwork Providence to offer rainwater collection barrels for your gardens at an amazingly inexpensive price. It’s not only a great way to save water but also an opportunity to support two organizations that are trying to make our city greener and healthier. Members of the Providence Community Growers Network (PCGN) are eligible to purchase rain barrels for $85 per barrel ($70 for each additional barrel). Unless you construct your own, we’ve found that this is one of the least expensive rain barrels. These rain barrels are made by Groundcorps, Groundwork Providence’s hands-on training and transitional employment program. Proceeds will support Groundwork Providence and SCLT’s PCGN. You can pick up your rain barrel on Thursday, June 27th, 5-7 p.m. SCLT and Groundwork staff will be there with advice on how to hook your new rain barrel up. 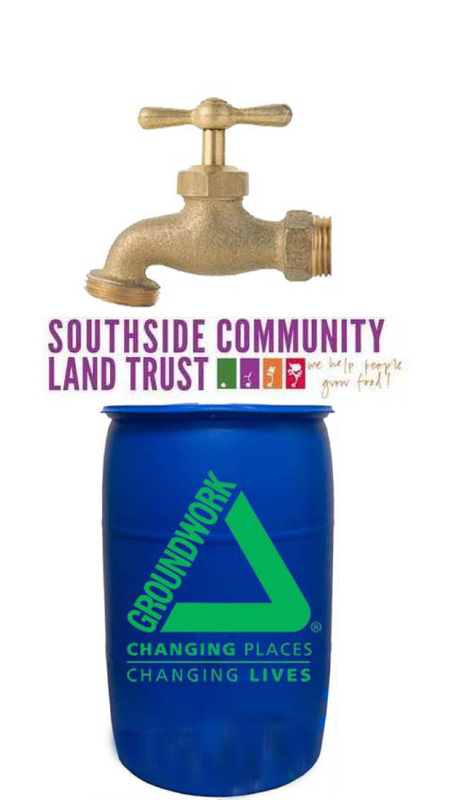 If you are interested in purchasing a rain barrel, you must email Liza Sutton, Community Growers Network Director, at liza@southsideclt.org by June 24th. On Monday evening Grow Smart RI celebrated individuals, projects and plans that promote the sustainable improvement and development of the state. 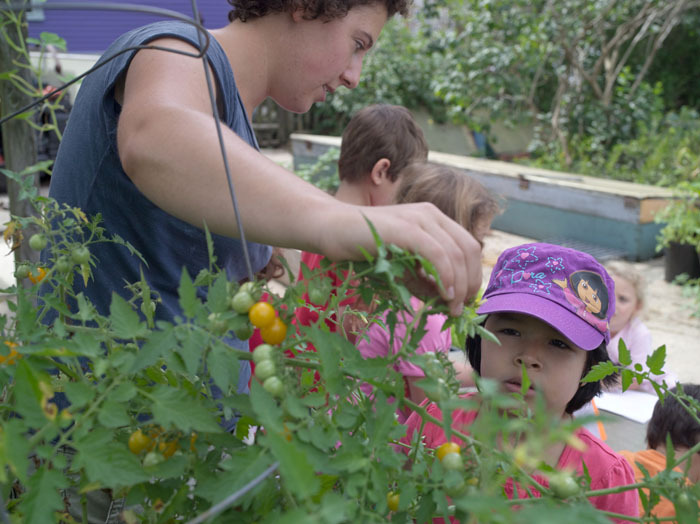 Grow Smart RI recognized SCLT and its Providence Community Garden Network (PCGN) as one of five outstanding growth projects that have both created economic benefits and improved communities and neighborhoods. The PCGN was honored for its work with transforming six acres of vacant lots throughout Providence into a network of 43 gardens where more than 300 individuals and families grow food to feed their households. In addition to helping improve food security in Providence, the network gardens have contributed to revitalizing many neighborhoods by turning vacant lots into lush oases of productive green space that promote community health. Many thanks to Grow Smart RI for this prestigious award. We’re excited to continue transforming barren spaces into vibrant community gardens and provide community members with the means to grow, eat and sell fresh, healthy food. Join us and be a part of urban agriculture history in Providence! You’ve heard about the new Lots of Hope program, and now is your chance to be a part of it! This month, the City of Providence and SCLT will begin construction of the program’s inaugural project–Manton Bend Community Farm. The community farm will be the first of its kind in Providence–an expanse of just over 1/2 acre of city-owned land that will change the landscape of Providence and how the city feeds itself. We are in need of 30 volunteers for both buildout days on June 22nd and June 29th. If you are interested in being a part of this exciting and innovative project, please contact Michelle Walker at michelle@southsideclt.org for more details. Interested in honing your hands-on experiential teaching skills? Apply for the SCLT Youth Garden Coordinator summer internship! SCLT is currently accepting applications for a summer intern to assist with our summer youth gardening programming. The intern will be responsible for working with SCLT’s Education Coordinator to coordinate and teach all aspects of SCLT’s Youth Garden Program. The intern will develop educational programs for youth ages 4-15 and teach daily lessons related to food cultivation and distribution, nutrition, health, ecology and local environmental issues. Click here to read a complete description of the Youth Garden Coordinator position. Applications are due by next Monday, June 10th! Plant Providence – Medicinal Herbs Workshop: Sat., June 8th, 3-5 p.m.
Join Mary Blue of Farmacy Herbs this Saturday, June 8th, from 3-5 p.m. at Groundwork Providence Community Garden (14-18 Ring St.) for a workshop on Medicinal Herbs. Farmacy Herbs is Providence’s viable example of accessible holistic health care. Mary and her crew of dedicated volunteers manage a 5-acre farm in West Greenwich, RI where they grow medicinal herbs and produce honey using organic methods. In addition to selling their herbs and honey, Farmacy Herbs also run several educational programs and are enthusiastic about sharing their knowledge of growing, preparing and using medicinal herbs. This Saturday you will have the opportunity to participate in one of their workshops and learn how you can grow and use organic herbs to support your health. Click here to pre-register. See you this Saturday!